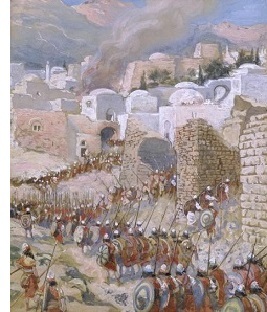 Fall of Jericho - "Now Jericho was tightly shut because of the sons of Israel; no one went out and no one came in. The Lord said to Joshua, 'See, I have given Jericho into your hand, with its king and the valiant warriors. You shall march around the city, all the men of war circling the city once. You shall do so for six days. Also seven priests shall carry seven trumpets of rams' horns before the ark; then on the seventh day you shall march around the city seven times, and the priest shall blow the trumpets. It shall be that when they make a long blast with the ram's horn, and when you hear the sound of the trumpet, all the people shall shout with a great shout; and the wall of the city will fall down flat, and the people will go up every man straight ahead.' So Joshua the son of Nun called the priests and said to them, 'Take up the ark of the covenant, and let seven priests carry seven trumpets of rams' horns before the ark of the Lord.' Then he said to the people, 'Go forward, and march around the city, and let the armed men go on before of the ark of the Lord.' And it was so, that when Joshua had spoken to the people, the seven priests carrying the seven trumpets of rams' horns before the Lord went forward and blew the trumpets; and the ark of the covenant of the Lord followed them. The armed men went before the priests who blew the trumpets, and the rear guard came after the ark, while they continued to blow the trumpets. But Joshua commanded the people, saying, 'You shall not shout nor let your voice be heard nor let a word proceed out of your mouth, until the day I tell you, 'Shout!" Then you shall shout.' So he had the ark of the Lord taken around the city, circling it once; then they came into camp and spent the night in the camp. Now Joshua rose early in the morning, and the priests took up the ark of the Lord. 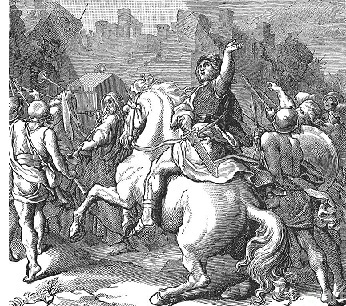 The seven priests carrying the seven trumpets of rams' horns before the ark of the Lord went on continually, and blew the trumpets; and the armed men went before them and the rear guard came after the ark of the Lord, while they continued to blow the trumpets.